As you can tell from my previous two posts, I’ve been very into smoothie bowls this summer. Most of the smoothies I make contain a frozen banana to make the smoothie super thick and creamy. While this makes the smoothie absolutely delicious, it does increase the sugar content. I don’t pay much attention to the amount of sugar that is in my smoothie, because the vast majority is natural sugar from fruit. However, I am aware that many people, especially people who follow special diets due to an illness or condition, DO pay attention to the amount of sugar in the recipes they make. Bananas are also relatively high in carbs, and replacing the banana with a lower carb alternative also helps to keep the carbs low as well. That’s why I created this smoothie bowl without any banana in the base. The secret ingredient to reducing the sugar in a smoothie recipe while still creating a super thick and creamy smoothie? Frozen cauliflower. Think I’m crazy? Give it a shot! 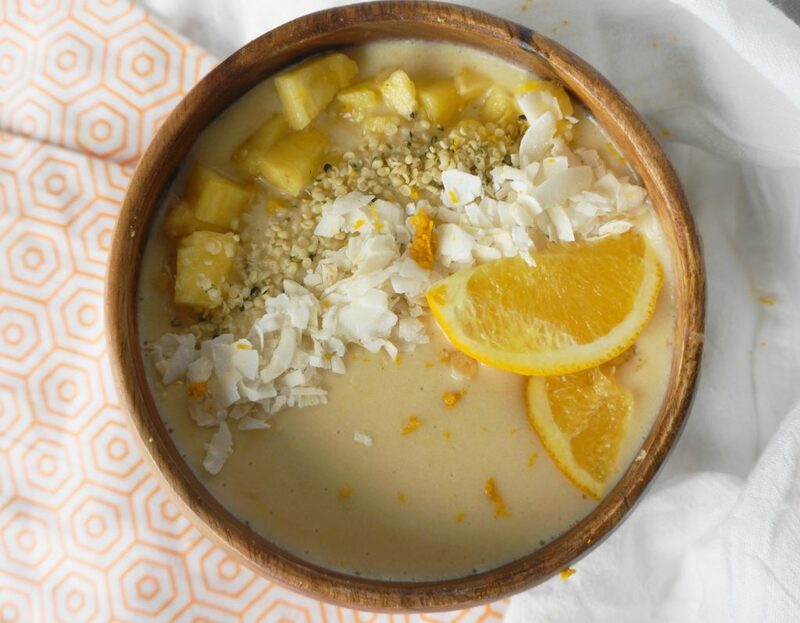 This Orange Pineapple Smoothie Bowl contains fresh oranges and pineapple, frozen cauliflower, plant-based vanilla protein powder, and almond milk. The flavors are so fresh and vibrant, and it’s packed with protein and vitamins. If you make this Orange Pineapple Smoothie Bowl, let me know in the comments! As always, follow Busy Girl Healthy World on Instagram for more healthy recipe ideas! Combine orange, frozen cauliflower, almond milk, and protein powder in a high-powered blender and process until smooth. 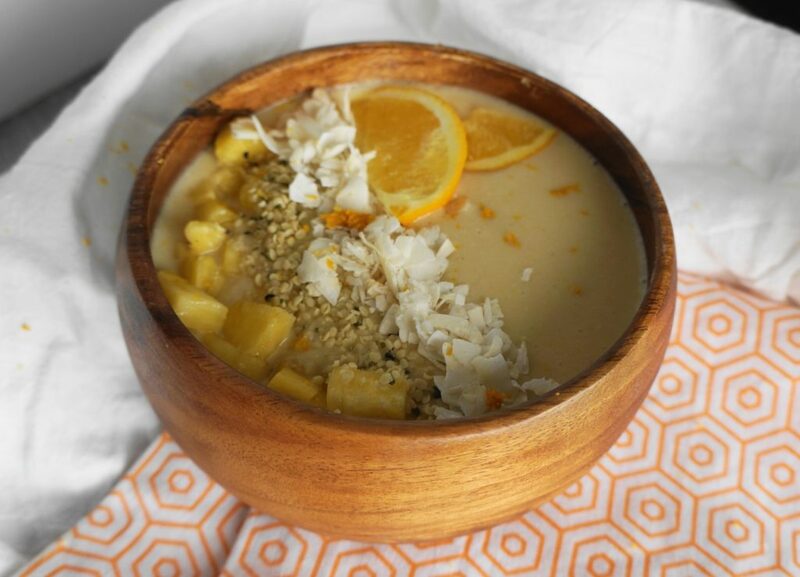 Transfer to a bowl and top with pineapple, hemp seeds, coconut flakes, and orange zest. Serve immediately.